I have adored Traci ever since I first stumbled across her blog (and the cafe shelves she made herself) back in 2009. Since then, Beneath My Heart has grown and grown and Traci is now spreading her talent to a second blog, Organize & Inspire! I am so excited to follow all of the great organizational ideas she will feature! Clever ways to organize are always my some of my favorite (and most needed) ideas!! 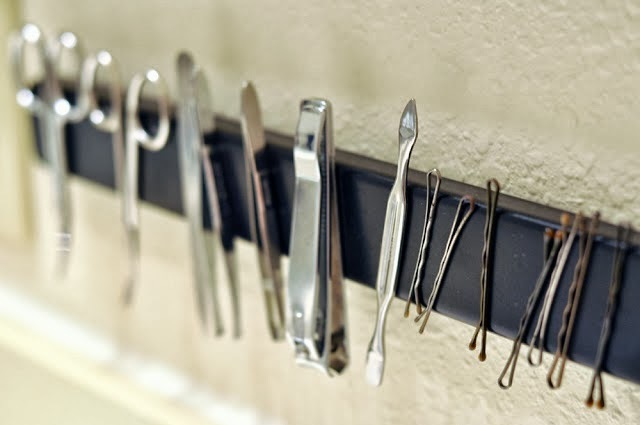 I am heading to Ikea tomorrow to pick up a magnetic knife rack after seeing this bathroom organization idea she featured. Instead of hanging it on the wall, I am going to secure it to the front of my drawer so the tweezers, clippers, and bobby pins don't end up buried in the back. The drawer is super shallow and I have yet to find a basket that will fit in it, but this magnet should do the trick! You can check out all of this tip and all of the great home organization tips that Traci features over at Organize & Inspire.